NEWLY RE-DESIGNED with NEW INDOOR PLAY AREA - check it out !! !For 10 years I have been coming to this French Restaurant in Holesovice and for 10 years I always order the same Galette savoury French pancake. Just imagine: coated with melted cheese, fried egg, baked cubes of bacon, sliced jacket potatoes all covered with oozy garlic butter on top. The latest novelty: the kids play area makes it just perfect. Back to the Creperie, I have been visiting for ages. The pancake that I’ve mentioned above is a lethal combination and I am glad we do not live closer, otherwise I would be forced to buy a whole new set of clothes (2 sizes larger)! To my liking, my son Marcus loves it as well, since it is very easy meal to eat for children. Gallettes are made of buckwheat flour and can be combined with just about anything including cheese, butter or spinach, for instance. They are quite big and cost around 85 to 115 CZK. If you’d prefer something sweet, then you might want to opt for the crepes made with pudding, apple mouse, chocolate or have them flambed (with liqueur poured all over and then set alight). La Creperie also serve yummy soups and the daily menu consisting of a soup + gallette will set you back around 95 to 115 CZK. Another specialty that they serve here is Cidre which is a fizzy apple drink imported from France. Each year around Autumn they organise a BOUJOLAIS NOUVEAU wine appreciation day. You reserve a table and drink! The latest novelty is a refrigerated counter-box offering pies and quiche of all kinds, lasagne, Brie cheese, sausages, salads, sun dried tomatoes, olives and other munchies. I didn’t try any of them though, I was too eager to stuff myself with my favourite Galette! The revamp has removed the old wooden tables and replaced them with new ones and the sofa has been removed to make way for the new indoor play area. When last visited I didn’t have my boys with me so I can’t tell you their opinions. 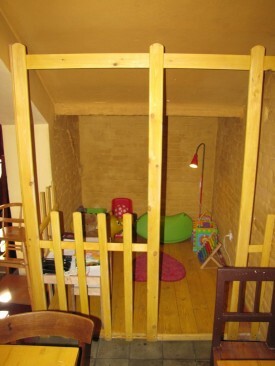 The older play area was too open to the restaurant and other customers, this one is more contained. If anyone has been there recently with kids let us know how it was. I love people-watching and over the years I have seen people from all walks of life come in here: backpackers, rastafarians, business men, young families and many more. My husband used to dislike the amount of smoke that would greet him each time, but this has all changed now. The days of being hit with a thick wall of smoke upon your arrival has long gone. 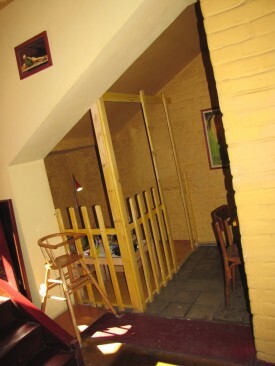 Now, you get welcomed by the sound of relaxing French music filling the air instead and a revamped, non-smoking front room complete with the kids’ play area. I used to smoke before kids came along and whenever I come here, a small part of me still gets nostalgic for the days when I could just pop in, single and carefree, for a quick ciggie. 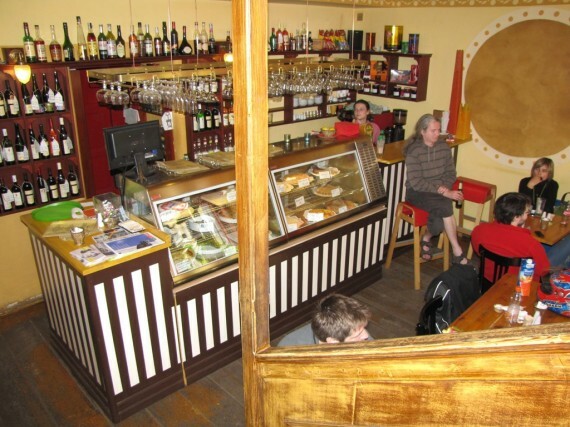 The French smoke like chimneys and being able to do so in restaurants, bars and cafes is ingrained in their culture. These days I feel I’m a bit more like Diane Keaton walking into a Parisian restaurant in my favourite movie As Good As It Gets. Celebrating her birthday, she takes out a cigar and smokes it, even though she is meant to be a non-smoker. Lighting one up is simply something that you do in a French restaurant or café, and La Creperie evokes a similar type of emotion in me. I must admit that, when I finally made it to France a few years ago, I was rather disappointed at not being able to find anything similar to my little creperie here in Prague. Oops, I almost forgot the children yes, both the crepes and gallettes are very suitable fodder for them. 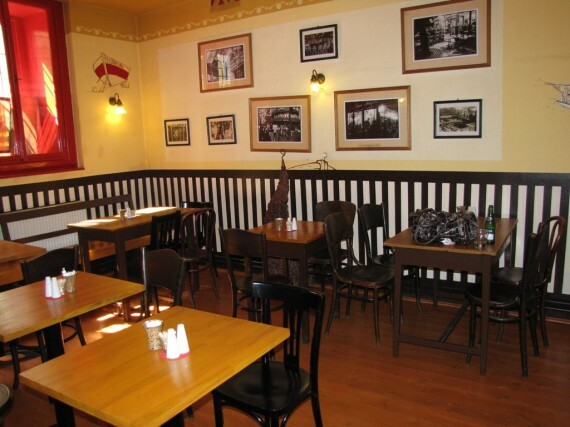 The availability of a high chair coupled with the toys in the kids’ play area, means that both young and old are guaranteed a jolly time at La Creperie in Prague. If you ring ahead you can even reserve a table right next to the kids’ area. I’m leaving here these 2 pictures of the old styling for nostalgia and fond memories. DIRECTIONS: Just around the block from busy Strossmayerovo Namesti tram junction. Trams no: 5, 8, 12, 14, 17, 25 or 26. Closest metro station: Red Line C, Vltavska; just walk up the hill, approx: 5 min. Parking available on Janovskeho street. Paid parking available 15m from the restaurant.